The other way a Gringo becomes a Latin Americanist is a college professor sits them down and talks about Salvador Allende. Talks about Chile in 1970; talks about Chile in 1973; talks about Chile in 1983. And like that kiss on the colonial street it feels like part of your soul just got ripped out, and you wind up chasing Latin America for years trying to find it and put it back. As much as I would have preferred to be a victim of the former, I most certainly fell in the latter. 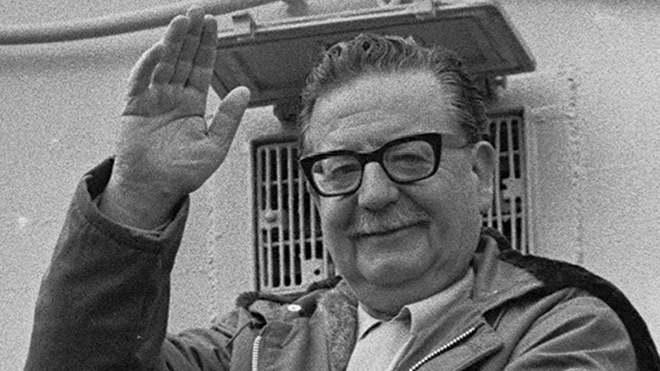 I had no idea about South America before I learned about the military coup d’etat that toppled Chile’s democratically elected President Salvador Allende forty year ago today, on September 11, 1973. I had no idea what I was getting into. When I first went Chile, I was psyched for rainforests and tropical beaches. But something about that moment in time forty year ago grabs you by the heart and does not let go. Perhaps it’s the audacity of the story. That in the thick of the Cold War, a non-violent “revolutionary” could be legitimately elected president in what was arguably South America’s most advanced democracy. Allende was not some fist pumping South American populist, leaning on rhetoric and handouts for reelection. He was a measured, cerebral man with the ability to harness the dreams of the dreamers and captivate the hopes of the hopeless for a serious, orchestrated cause. Perhaps it was the electricity of the moment. Today, political culture is generally indifferent and apathetic. On Syria we post pithy articles from The Onion on facebook, and then get back to Miley Cyrus twerking. 1970s Chile had real political dialogue, and footage of miners, students and the urban poor debating at length with incredibly informed opinions on economic development. Millions of people took to the street those years in protests and counter-protests. Perhaps it was that Allende was a democratic stalwart—respecting elections and the constitution while remaining stubbornly ideological throughout. Much is made of Allende’s lack of a mandate: he won but 36.2 percent of the votes in the 1970, but this was not an uncommon result in Chilean presidential elections that frequently featured three viable candidates. In fact, in 1958, right-wing candidate Jorge Alessandri won the presidential election with a 31.6 percent plurality. Elections remained free and fair even when defeat proved costly. In 1972 the Allende’s Unidad Popular party failed to win critical by-elections in two rural regions that had benefited from Allende’s agrarian reform. Allende respected the results. When the legislature denied Allende’s request for emergency powers in August of 1973, he refused fervent demands from his supports to dismiss the Congress. The only reason the Chilean right, facist elements of the Chilean military, and the Nixon White House ultimately supported a coup was because early 1973 congressional elections underscored the popular support for Allende’s movement. Regular Joses who pushed themselves to extremes to keep the Allende presidency afloat. When a CIA funded a trucker’s strike paralyzed the Chilean economy and brought public transportation in Santiago to a standstill, farmers rallied to the city, driving flat-back trucks to move people and goods around the town. Quedar, quedar, poder popular, went the chant. When official US aid dropped from US$59.3 million in 1970 to US$13 million in 1972; when US policy makers leveraged influence in The World Bank and the Inter-American Bank to cut loans to Chile from US$32.2 million in 1970 to zero in 1972; when American banks slashing financing from US$220 million in 1970 to less than US$20 million by the end of 1972, Chileans pushed on. Allende, Allende, el pueblo te defiende, went the chant. When the managers of Chilean mines went on strike to destabilize copper production (the country’s life blood) in an attempt to provoke a crisis that would undermine Allende, the rank and file miners disobeyed orders to close the mines. Instead, they resumed production themselves, giving it their all to keep production up. The workers proved once and for all that they could manage too. Yes, there is a statue of Allende in downtown Santiago, and yes, you can buy Allende tee-shirts in most markets. But I am not sure that Latin American popular power has ever recovered. Today’s leftists may hit the high notes on rhetoric, but their promises ring hollow. Hugo Chavez couldn’t even police his own capital city: Caracas’ murder rate spiked even as Venezuelan state coffers overflowed under his watch. His successor talks to parrots. Does anyone honestly believe the Cristina Kirchner presidency in Argentina will have long term tangible benefits for the country’s middle class and poor? Does anyone honestly have faith in Rafael Correa’s commitment to democracy or freedom of speech? Can the Mexican left do anything besides throw tantrums? I am not sure if Chile ever recovered. Its political institutions have been forged by an uneasy compromise and coexistence between the outgoing military and incoming democracy. Its entire electoral system is geared towards preventing a progressive tilt. Chileans have recovered their sense of protest, but I don’t believe they have recovered their sense of purpose. I have since learned that there are no rainforests or tropical beaches in Chile. I have also kissed a dark-eyed, dark-haired enchantress on a dimly lit colonial street. And there was something about that kiss that was so pure, so electric, and ultimately so fleeting that I stand by that nostalgic and painful memory like a flag. I guess that is how I feel about Chile in 1971, 72, and 73. I guess that’s how I feel about Allende. Samuel George is a Project Manager at the Bertelsmann Foundation, developing the Global Economic Dynamics Project’s Latin America Portfolio. This entry was posted in Andean Region, Uncategorized and tagged allende 40th aniversary, allende pinochet, Chile 9/11, Salvador Allende, the other 9/11. Bookmark the permalink. Very nice paper, thank you !